The young Simtek team was in for more at Barcelona after having to endure the horror of Roland Ratzenberger dying at Imola's not-yet-emasculated Villeneuve corner. F1 had hardly taken a breather after Karl Wendlinger crashed into a coma in the Monaco chicane. 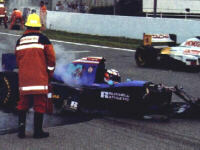 And to go one further, Pedro Lamy had been catapulted into a passenger tunnel during a Silverstone test. Now everyone was shocked by Montermini's Spanish practice shunt. Although Andrea didn't quite walk away from the accident, as a popular F1 proverb likes to call surviving such a horrific crash, he was very lucky to live. Somehow nobody understood why Andrea came back to F1 just to be at the, well, blunt end of the grid. The year before he had stepped into an Indycar, taking the heavily underfunded Euromotorsport Lola to an amazing fourth place at Detroit. Strangely enough this never sprouted an Indycar career of any significance for the Italian who returned to Europe with Pacific and Forti (here in Irish Shannon livery), thereafter only to be remotely connected to F1 by the fact that his name popped up for the occasional test driver seat. It was a shame that Montermini, with all his talent, never managed to do 'a Zanardi' in the States. Andrea's countryman, here seen watching the carnage, ironically just came back to replace Lamy after a shunt of his own at Spa had sidelined him for six months. Alex took a similar turn to Indycars a few years later after seeing his F1 career slowly extinguish with Lotus. And we all know how that brought some change of luck.